Buying a used car can be a stressful experience. How do you choose between appearance and performance? How do you know that the specifications meet your requirements? To make the purchasing of any vehicle a breezy experience, Dr. Roadworthy provides you quality pre-purchase inspections. At Dr. Roadworthy, a pre-purchase inspection is performed by licensed mechanics who are qualified auto technicians. They give the vehicle a thorough look-over and carefully inspect the mechanical and safety prospects of the car. Through a proper pre-purchase inspection the mechanic can bring into light any current conditions or potential issues that could appear in the future. Why Is Pre-Purchase Inspection Important? A pre-purchase inspection is essentially a report clarifying the condition of the vehicle. When someone finds a car that they really like, it might be tempting to jump to the conclusion that it is “the one”. But rushing through the process of buying to get into the driver’s seat as soon as possible is not a very good decision while buying any kind of vehicle. Included in the Pre-Purchase Condition Report. The issues and conditions that our qualified technicians spot can only be recognized with an experienced eye and will be overlooked by others. Many buyers are deterred to get the vehicle inspected before buying it but, this is a grave mistake. With little planning and careful execution, the inspection process will take a minimal amount of time and can help you save your money from a bad investment. Better safe than sorry, right? Why Employ Our Services To Get A Pre-Purchase Inspection? Our technicians and experienced personnel will give you and unbiased and true opinion on the wear of the vehicle. 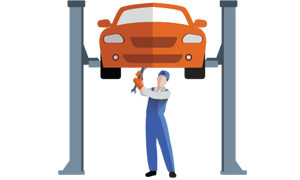 We efficiently conduct a proper and thorough inspection of the vehicle you want to buy. This ensures that you know everything about the condition, wear, and potential risks of the vehicle before investing your money in it. Inspection of the vehicle ensures that you can avoid any unforeseen circumstances and unpleasant surprises. Our mechanics are more than specially trained personal. Apart from the technical knowledge they have vast practical experience and are adept in using special inspection equipment. This is why the pre-purchase inspection is one of the most important steps to be taken before the purchase of a vehicle. Once the full-proof inspection is complete, you can have a one-on-one chat with our examiners and get any vehicle-related questions answered. What Do Pre-Purchase Inspections Cover? The inspection service offered by Dr. Roadworthy is a comprehensive one. It covers the detailed checking of lights, radiator, suspensions, brakes, seatbelts, engine, paint, seats, electrical systems, and child restraints to name a few. Our examiners also test the condition of the vehicle through road tests. The team of mechanics at Dr. Roadworthy is not just the employees of the company but the hands and legs of our successful enterprise. Nowhere else will you find a more dedicated group of expert individuals, constantly striving towards quality services and client satisfaction. There are 0 comment. on "Pre-Purchase Inspections"